Is there any reference that Krishna was connected to Brahman while speaking Gita? I recently came across a claim that it is not Krishna who spoke Bhagavad Gita, but he was connected to Brahman while speaking Gita. Is there any reference for this? Apparently this comes from a statement from Anugita, as another member Lakhi has posted. Here's the explanation given by the authors of the Narayanastra blog. They explain Yoga as "Dhyana" as in thought/will instead of being in meditation or connection with brahman. In this context, the meaning for this anugita reference is as below. Indeed, the highest knowledge (paraM) of the vedas (brahma) was described by me (on the battlefield), by making use of my will which is unfettered (yoga yuktEna), ie, it was not because you performed any sAdhana to earn it. But now (on account of your rejection of my grace), I shall relate to you an ancient history based on that subject. Wherein yogayuktena is explained as "by using my unimpeded divine will or sankalpa", not that he was in yogic connection to another entity. I discoursed to thee on Supreme Brahma, having concentrated myself in Yoga. Lord Krishna was not a mediator of someone else and he spoke Bhagavad Gita directly. However, some claim it was not him and he was just meditating on Brahman. The reason for that claim comes from a single passage from Anugita Parva of the Mahabharata. (Chapter 16 from Ashwamedha Parva). The passage is as follows. To be more precise, it is three or four shlokas. It is impossible for me, O Dhananjaya, to repeat, in detail, all that I said on that occasion. That religion (about which I discoursed to thee then) is more than sufficient for understanding Brahma. I cannot discourse on it again in detail. I discoursed to thee on Supreme Brahma, having concentrated myself in Yoga. So, let us look at some more context and detail what caused Lord Krishna to say those words to Arjuna. From the same chapter (with my emphasis). Arjuna forgot every sacred teaching very soon after the battle has ended. If we think, he got under influence of Maya again when his son Abhimanyu died. He forgot that he is only a tool of destruction of both the sides and felt proud of his victories. Lord Krishna went to a separate state (Yoga with himself) to show his universal form to Arjuna. He revived a lost knowledge and discoursed it to Arjuna but Arjuna forgot it due to fickleness of his mind. This caused a displease to Lord Krishna and he said the following as a reply. Vasudeva said, 'I made thee listen to truths that are regarded as mysteries. I imparted to thee truths that are eternal. Verily, I discoursed to thee on Religion in its true form and on all the eternal regions. It is exceedingly disagreeable to me to learn that thou didst not, from folly, receive what I imparted. The recollection of all that I told thee on that occasion will not come to me now. Without doubt, O son of Pandu, thou art destitute of faith and thy understanding is not good. It is impossible for me, O Dhananjaya, to repeat, in detail, all that I said on that occasion. Due to the that reason, Lord Krishna did not say that again and again because Bhagavad Gita is not a simple story or normal passage to say again and again. So, Lord Krishna did not repeat the same. He gave another way instead of repeating again. Based on the passage, some people say that it is Nirguna Brahman who was speaking through Krishna. But Nirguna Brahman is devoid of all the senses and disinterested. He/That doesn't take part in any action. All the actions happen under the influence of Prakruti. However Prakruti itself is spawned under the control of "Absolute Brahman". Is this notion that Nirguna Brahman is speaking through Krishna accepted by any commentator? No. Adi Shankaracharya who consolidated Advaita Philosophy and identified himself with Brahman also wrote in his commentary that it is Lord Krishna who spoke Gita to Arjuna in the midst of battle field. It is because it is mentioned several times that it was Lord Krishna himself who said Bhagavad Gita to Arjuna. When Lord Krishna showed his universal form, Arjuna was not able to se it completely with his naked eyes. He asks Lord for forgiveness and prays him to return to his usual form. Former form: which is so dear to you, four-armed, wearing a concb, discus and a club. His Own: as born in Vasudeva’s family. Like a couple of sticks generating a blazing fire, thou hast been born of the divine Devaki and Vasudeva for the protection of Brahma on earth. It was then that the original Creator (Adi.kartri), Vishnu, known as Narayana, wishing to maintain order in the universe, incarnated Himself as Krishna, begotten in Devaki by Vasudeva, for the preservation of the ‘earthly Brahman ‘ of spiritual life (Brahmanatva) on the earth. For it was by the preservation of spiritual life that the Vedic Religion could be preserved, since thereon depend all distinctions of caste and religious order. vyAsena grathitAM purANamuninA madhyemahAbhAratam . amba tvAmanusandadhAmi bhagavadgIte bhavadveShiNIm . O! (universal) mother! bhagavad-gita! I meditate on you. With you Partha was enlightened by the Lord Narayana Himself amidst mahAbhArata war. The ancient sage vyAsa set you in the middle of the great epic mahAbhArata composed by him. You are divine, bestower of nectarian advaita philosophy in the form of eighteen chapters, sure antidote to the repeated births (saMsAra). There is no dispute among the Vaishnava commentators that the person who spoke is none other than Krishna. Because they agree that either it is Krishna/Vishnu speaking directly instead of being mediator. Because Arjuna forgot the divine message within a few days, Lord was reluctant to say that again. That caused him to say "it is impossible to discourse the same message again". Anyways, it would be a cakewalk to him because he learnt 64 arts and 14 sciences each per day. Saying the shlokas again which are around 720 is not that hard to him. He is not an ordinary human like us. Lord Krishna is a manifestation/avatar of Lord Vishnu, who in turn is a manifestation of the source—Brahman. Brahman is the source of everything and is behind everything. Contrary to what ISKCON and most Vaishnavites teach, it is Brahman who is speaking through Lord Krishna/Vishnu in the Bhagavad Gita. It is Brahman who is the goal of Yoga. I'm a Vaishnava because I believe that Lord Vishnu is the most important manifestation of Brahman (one can see this in the Vedas. It is Lord Vishnu who is Purusha). When I worship Lord Vishnu, like any other Deva, it is Brahman whom I'm actually worshipping. Chapter 10, Verse 19 The Blessed Lord said: Yes, I will tell you of My splendorous manifestations, but only of those which are prominent, O Arjuna, for My opulence is limitless. Chapter 10, Verse 20 I am the Self, O Gudakesa, seated in the hearts of all creatures. I am the beginning, the middle and the end of all beings. Chapter 10, Verse 21 Of the Adityas I am Visnu, of lights I am the radiant sun, I am Marici of the Maruts, and among the stars I am the moon. Chapter 10, Verse 22 Of the Vedas I am the Sama-veda; of the demigods I am Indra; of the senses I am the mind, and in living beings I am the living force [knowledge]. Chapter 10, Verse 23 Of all the Rudras I am Lord Siva; of the Yaksas and Raksasas I am the lord of wealth [Kuvera]; of the Vasus I am fire [Agni], and of the mountains I am Meru. Chapter 10, Verse 24 Of priests, O Arjuna, know Me to be the chief, Brhaspati, the lord of devotion. Of generals I am Skanda, the lord of war; and of bodies of water I am the ocean. Chapter 10, Verse 25 Of the great sages I am Bhrgu; of vibrations I am the transcendental om. Of sacrifices I am the chanting of the holy names [japa], and of immovable things I am the Himalayas. Chapter 10, Verse 26 Of all trees I am the holy fig tree, and amongst sages and demigods I am Narada. Of the singers of the gods [Gandharvas] I am Citraratha, and among perfected beings I am the sage Kapila. Chapter 10, Verse 27 Of horses know Me to be Uccaihsrava, who rose out of the ocean, born of the elixir of immortality; of lordly elephants I am Airavata, and among men I am the monarch. Chapter 10, Verse 28 Of weapons I am the thunderbolt; among cows I am the surabhi, givers of abundant milk. Of procreators I am Kandarpa, the god of love, and of serpents I am Vasuki, the chief. Chapter 10, Verse 29 Of the celestial Naga snakes I am Ananta; of the aquatic deities I am Varuna. Of departed ancestors I am Aryama, and among the dispensers of law I am Yama, lord of death. Chapter 10, Verse 30 Among the Daitya demons I am the devoted Prahlada; among subduers I am time; among the beasts I am the lion, and among birds I am Garuda, the feathered carrier of Visnu. 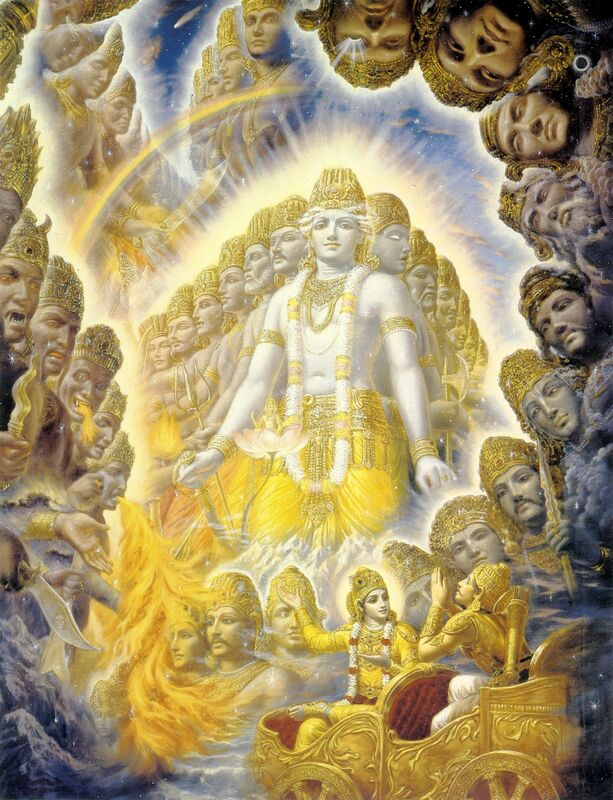 Chapter 10, Verse 31 Of purifiers I am the wind; of the wielders of weapons I am Rama; of fishes I am the shark, and of flowing rivers I am the Ganges. Chapter 10, Verse 32 Of all creations I am the beginning and the end and also the middle, O Arjuna. Of all sciences I am the spiritual science of the Self, and among logicians I am the conclusive truth. Chapter 10, Verse 33 Of letters I am the letter A, and among compounds I am the dual word. I am also inexhaustable time, and of creators I am Brahma, whose manifold faces turn everywhere. Chapter 10, Verse 34 I am all-devouring death, and I am the generator of all things yet to be. Among women I am fame, fortune, speech, memory, intelligence, faithfulness and patience. Chapter 10, Verse 35 Of hymns I am the Brhat-sama sung to the Lord Indra, and of poetry I am the Gayatri verse, sung daily by brahmanas. Of months I am November and December, and of seasons I am flower-bearing spring. Chapter 10, Verse 36 I am also the gambling of cheats, and of the splendid I am the splendor. I am victory, I am adventure, and I am the strength of the strong. Chapter 10, Verse 37 Of the descendants of Vrsni I am Vasudeva, and of the Pandavas I am Arjuna. Of the sages I am Vyasa, and among great thinkers I am Usana. Chapter 10, Verse 38 Among punishments I am the rod of chastisement, and of those who seek victory, I am morality. Of secret things I am silence, and of the wise I am wisdom. Chapter 10, Verse 39 Furthermore, O Arjuna, I am the generating seed of all existences. There is no being-moving or unmoving-that can exist without Me. Chapter 10, Verse 40 O mighty conqueror of enemies, there is no end to My divine manifestations. What I have spoken to you is but a mere indication of My infinite opulences. Chapter 10, Verse 41 Know that all beautiful, glorious, and mighty creations spring from but a spark of My splendor. Chapter 10, Verse 42 But what need is there, Arjuna, for all this detailed knowledge? With a single fragment of Myself I pervade and support this entire universe. Who was telling secret of Chakravyuha to Subhadra? Krishna or Arjuna?